Making dessert does not have to be time consuming. 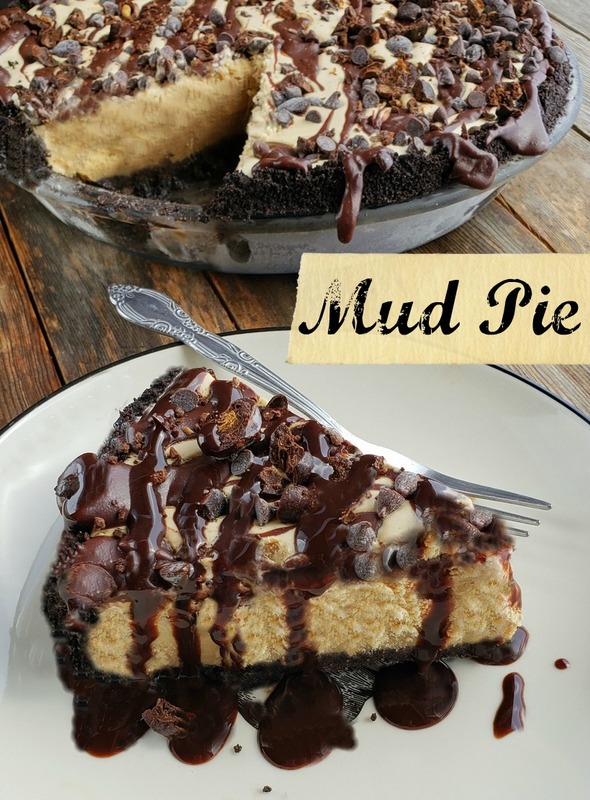 This Mud Pie recipe is the perfect, sweet ending to your next meal. Sometimes we put so much time and effort into the main meal, we don’t often have enough time to prepare a proper dessert. However, that’s not the case with this Mud Pie. It is simplicity from start to finish and it’s something you can make a day or two (even three) ahead! Making any type of ice cream cakes are one of my favorite things to throw together for a get-together. They are literally so simple, especially if you don’t make the ice cream yourself. Have you ever made my Whoppers-Malted Milk Ice Cream Cake or my Strawberry-Chocolate Chip Ice Cream Cake? They are both requested often by family and friends and couldn’t be simpler to put together. 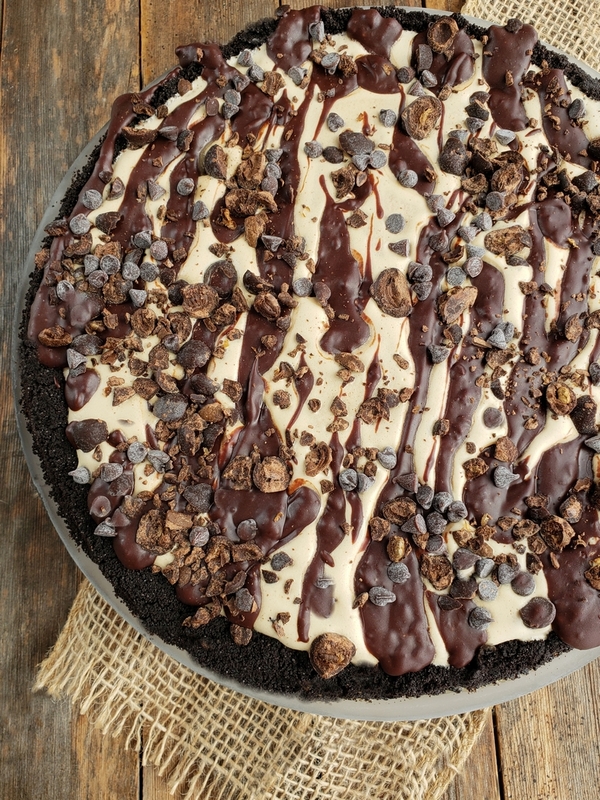 You’ll want to use a simple 9-inch pie plate to make this Mud Pie. When you press in the cookie crust, you’ll want to build up the edges so you can fit as much ice cream in there as possible. Your crust edges will seem high, but trust me, this is what you want. When it’s finished, you will have a perfectly beautiful dessert to share and enjoy with friends. Make you have enough friends over to finish this one off, otherwise you’ll find yourself with a fork at the freezer door in the middle of the night! I would call this perfection. If I had to choose a dessert for my next gathering of friends, this would definitely be on the top of my list. I love quick and easy pie recipes and this Easy Pistachio Pie is on the top of my list. This Easy No Bake Coconut Cream Pie is also one of my favorite simple desserts. And Easy Fresh Cherry Pie is something everyone should know how to make. Four years ago I posted this recipe for Simple Chicken Tenderloin Parmesan and it is by far one of my most popular recipes. Five years ago I showed you what to do with that last piece of apple pie…Greek Yogurt-Apple Pie Milkshakes. Seven years ago this Grilled Broccoli and Lemons was eaten all summer long. Eight years ago Harry Potter’s Butterbeer was pretty popular at my house. And nine years ago these Department Store Cookies made my life. Have you joined our Noble Pig cooking community? Would love to see you there. Making dessert does not have to be hard. 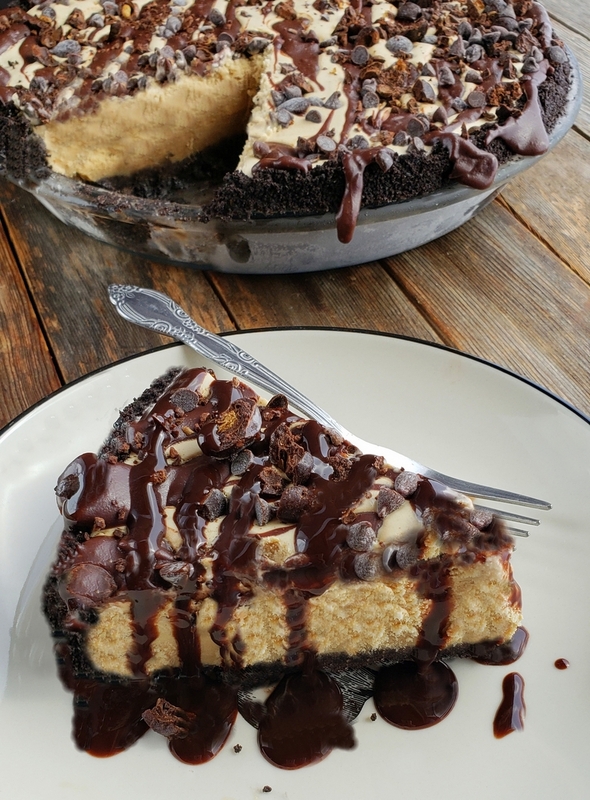 This Mud Pie recipe is the perfect sweet ending to your next meal. In a food processor, process the chocolate wafer cookies until crumbs form. Add the butter and sugar and continue to pulse until moistened. 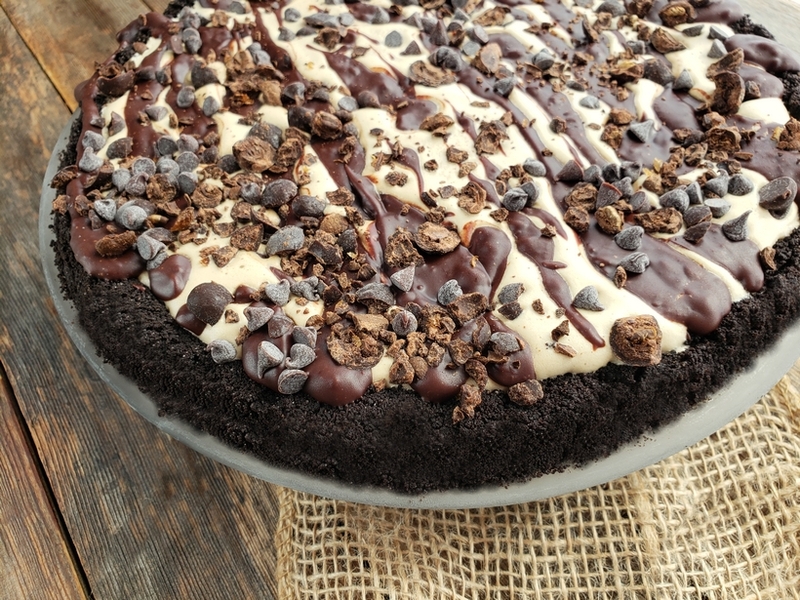 Press the chocolate cookie mixture into the bottom and up the sides of a 9-inch pie plate (you really want to build up the sides so they become a well when you pour the ice cream into the crust). A straight-sided dry measuring cup to help you get the inside edges smooth. Bake until dry, about 10 to 12 minutes. Let cool completely. 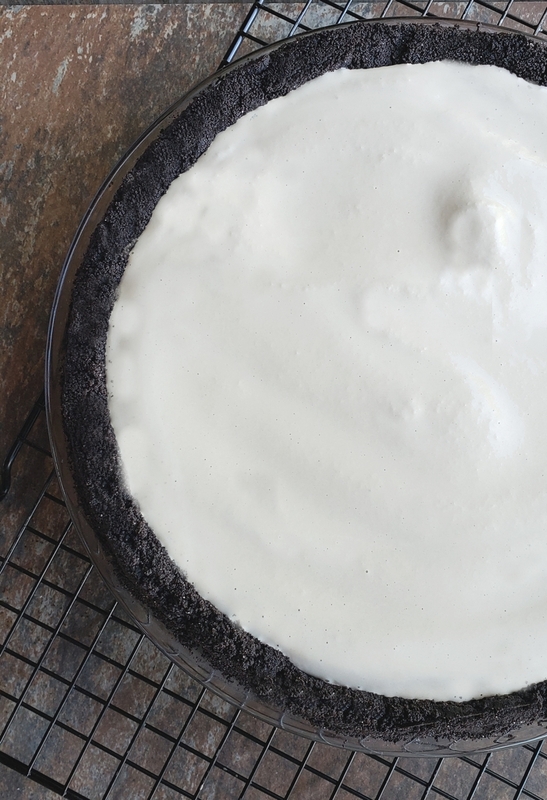 Spread the ice cream mixture evenly over the cooled crust, making the top smooth. Freeze for one hour. Make sure pie plate is on a completely flat surface in the freezer. To make the topping, place heavy cream in a small saucepan over medium-high heat and heat to very warm (buubly), about 1 minute. Add 2 oz of chocolate chips and stir until mixture is very smooth. Drizzle over the partially frozen ice cream cake. Sprinkle with crushed espresso beans and mini chocolate chips. Cover and freeze until firm another 6 hours or overnight. Before serving, remove the pie from freezer and let rest for 10 minutes. 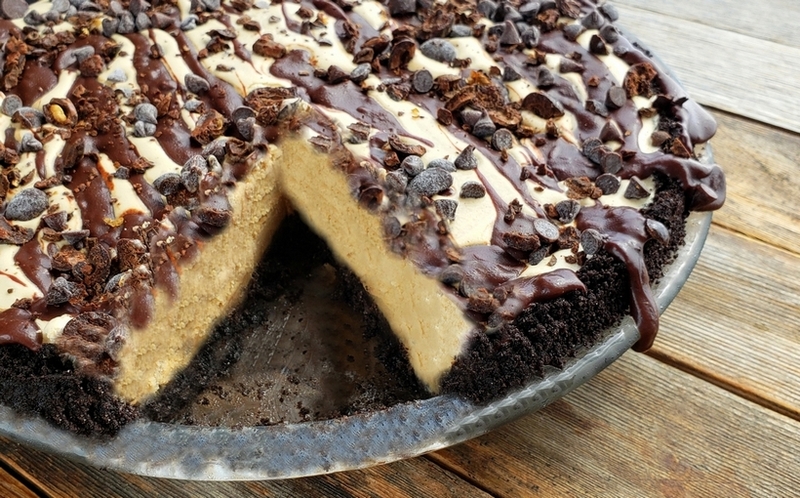 I’m a huge fan of coffee ice cream AND chocolate cookie crust. My dream dessert! CAn’t wait to get closer to the holidays to make this for my family! Such a gorgeous pie. I love all that deliciousness on top! Totally in love with this dessert. Easy to make, and SO decadent! OMG!!! Looks so yummy! Am gaining weight just looking at this. What a wonderful dessert for a special occasion!!! This is the ultimate pie – always a big hit! Are chocolate wafer cookies Oreos? No…chocolate wafers are chocolate all the way through.